Defining the "Mission of the Church"
The church is a sign and instrument of the kingdom of God, a people united by faith in the gospel announcement of the crucified and risen King Jesus. 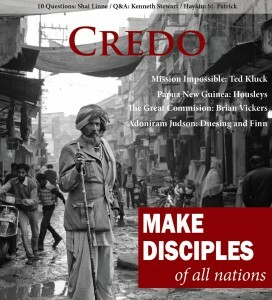 The mission of the church is to go into the world in the power of the Spirit and make disciples by proclaiming this gospel, calling people to respond in ongoing repentance and faith, and demonstrating the truth and power of the gospel by living under the lordship of Christ for the glory of God and the good of the world. The mission of the church is to know Jesus Christ and to bear the fruit of His Spirit. We only truly love in the “agape” way when we first grasp how He demonstrated His love for us – by forgiving us all our sins; by freeing us from the impossible standard of the Law; and by giving us a brand new identity in Him. Once we see the glory of the new covenant promises to us, we can transmit His love to the world around us. Broadly, God has given His new covenant people on Planet Earth the glorious tasks of proclaiming the God-man Jesus – His substitutionary sacrifice and resurrected Lordship – and of living as a distinct society of Spirit-filled citizens who, little by little, are learning to embody Jesus’ own love, mercy, and justice toward one another first and the nations second, all for the sake of displaying the matchless glory of the Father. For the purpose of fulfilling these great tasks and ends, Jesus has authorized regular gatherings of two or more new covenant members to constitute themselves as official outposts of the kingdom, or local churches, or exercising the keys of the kingdom through preaching the gospel, binding and loosing those who confess with baptism and the Lord’s Supper, teaching everything that Christ has commanded, and spurring one another on to the aforementioned love and good deeds. The mission and responsibility of the church includes both the proclamation of the Gospel and its demonstration. From Jesus, we learn the truth is to be proclaimed with authority and lived with grace. The church must constantly evangelize, respond lovingly to human needs, as well as “seek the welfare of the city” (Jeremiah 29:7). By living out the implications of the gospel, the missional church offers a verbal defense and a living example of its power. Are we speaking of the local church as an institution or the church as individuals scattered throughout society? How are we defining terms like “teaching” and “gathering” and “sending”? Is it important to define what the church is before defining what the church does? And is it possible to define the church apart from God’s mission? How do we define terms like “nations” and “disciples”? In thinking through these and other issues, I’m inclined to see the identity of the church – God’s called-out, “sent,” kingdom people – as an illuminating framework for wrestling with the other related issues of evangelism, mentoring, disciple-making, mercy ministry, etc. In the end, the “mission of the church” is part of an ongoing discussion that I hope will encourage us as the people of God to embrace our missionary identity. How would you define the mission of the church?